Looking for an effective heartworm medication? Are you looking to save some money as well? Valuheart might be the perfect 2 in 1 solution to all your travails. The active ingredient in Valuheart is Ivermectin, which also happens to be the kicker in popular heartworm preventative: Heartgard. The simple fact is that Heartgard and Valuheart are nearly identical except for the packaging. The only major difference is the money you’ll save purchasing Valuheart. For almost half the price of the better known Heartgard, you can grab a packet of Valuheart and provide your pets with the same protection while paying 50 percent of the price. 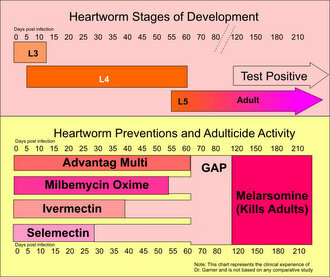 Symptoms of heartworm are extremely difficult to identify until the very late stages of the disease’s onset. That’s why it is very important to get your dog or cat checked for the disease regularly, and to always treat it with a monthly preventative. Because it is much easier and cheaper to avoid heartworm than it is to cure it. Heartworm is one of the most debilitating and devastating diseases for a family to contend with when it comes to their pets. It is a serious problem that senselessly cuts down many beloved family pets in their prime. Since heartworm is such a painful, sneaky, and pervasive disease in the pet population, there are a variety of medications on the market and in consistently in development for its treatment. This huge variety can make a purchase decision very difficult. That’s why it’s important to identify your criteria for the buy. If you’re looking for a cure all medication, a “net” to take out worms, fleas, ticks, mosquitos, mites, sarcoptic mange, and all other possible threats then you’ll probably have a short list of expensive pet meds that can actually handle your needs. However, if you’re looking for the specific problem of heartworm prevention to be solved, you’ll need a “harpoon” type of treatment to make a single swift strike against the biggest enemy you or your pet are likely to encounter, then Valuheart may be your most attractive option. Valuheart has the same efficacy, delivery system, and legitimacy as Heartgard. The only difference is in price. Both these ivermectin fueled pet meds are powerful, effective, and fast acting, but one is definitely much more affordable than the other. Many customers consider cost as an indicator of how effective a medication can be, but in this case nothing could be further from the truth. Superior marketing, an established name brand, and an excellent product have all contributed to the success of Heartgard. However, the well-known pet medication doesn’t have much to boast over its generic competition. Everything that Heartgard offers can be duplicated and appreciated by users of Valuheart. Because they share the same active ingredient and tablet type delivery they’re virtually twin brothers in the world of veterinary medicine. They treat the same animals, (either dogs or cats) and they come in the same size variations. The only real difference is image. Take a closer look at Valuheart today!